I’m grateful that we don’t often get sick, but when we do, it is typically the runny nose and mild cough type of illness (or just seasonal allergies). I use my natural remedies to help speed recovery, but inevitably, at least one of the children will end up with a sore, red nose from wiping it too often. I’d always heard to rub Vaseline on dry, chapped noses, but I’m very much not a fan of petroleum jelly (more on that in another post) and wanted a better option. Certainly, several bulk ingredients I always keep on hand, like Shea Butter and Coconut Oil work wonderfully on their own for chapped noses, but I wanted to create something with beeswax that would also help protect the skin from future kleenex abuse. 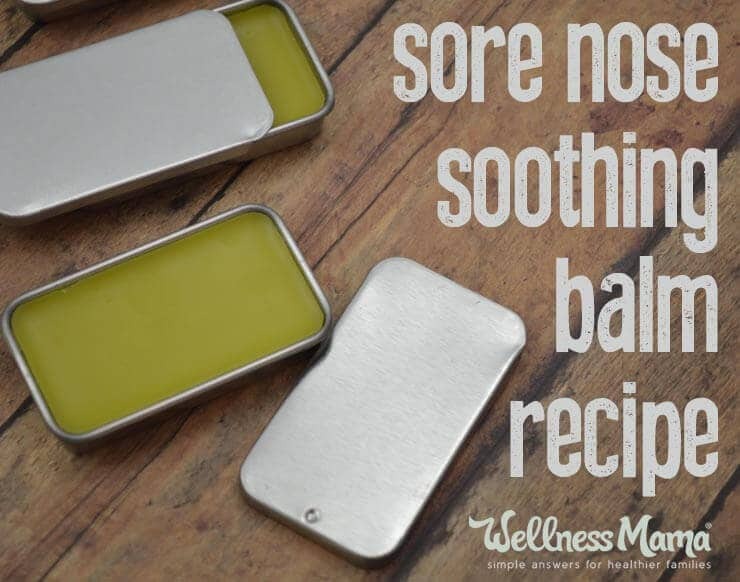 To keep it simple, you could use shea butter or coconut oil alone to sooth a sore nose. 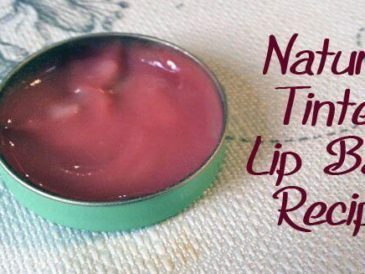 A pre-made lip chap like my classic recipe also works, but I don’t like using lip balm containers for this since some of the bacteria/snot/general nastiness might be left on the balm, so the entire tube would need to be thrown out after the illness has passed. This soothing balm in a tiny metal tin solves both problems. 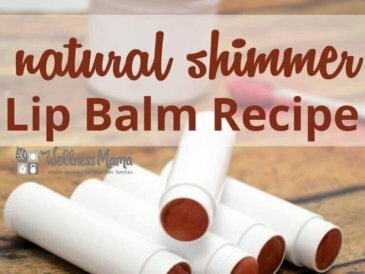 It is petroleum jelly free, not in a one-time use tube and it combines all of the soothing and protective ingredients with herbs for an extra boost. I added an additional but optional step of infusing the oil with the dried herbs I use in my healing salve to give this soothing balm additional skin-nourishing properties. You can leave out this step, but I highly recommend it. Place the oil in a double boiler. If using coconut oil, melt the oil first. Add the herbs. Simmer on low heat for 3-4 hours or until the oil has taken on a green color from the herbs. Be careful not to have the heat too high or leave too long. If warm enough, you can also simply place the herbs into the oil in an air tight glass jar and leave for 2-3 weeks. This works best in indirect sunlight and won’t be possible at all times. Melt all ingredients in a double boiler or small glass bowl over a small saucepan of water. Stir well and pour into individual tins or a small glass jar. Can double or triple recipe if desired. Pour into containers, tins or a small glass jar. 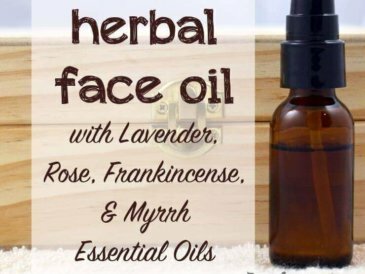 To use: scrape off a small amount with a clean spoon or fingernail and apply to the skin around the nose. To avoid contamination, do not re-use the same spoon or finger until it has been washed. 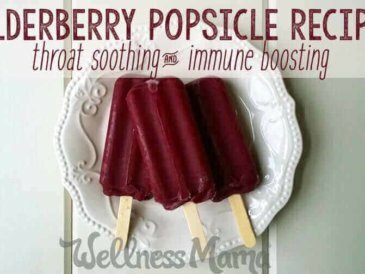 Use as needed until redness and soreness is gone. This recipe will fill approximately two ½ ounce round tins or one 1-ounce round tin from this link. The square containers I used are available here and this recipe will fill 4-5 of them. 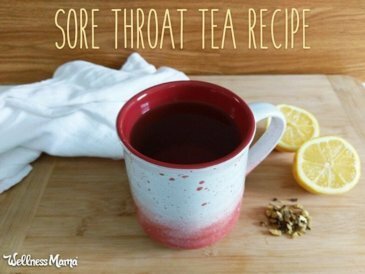 What do you use to sooth sore noses? Share below!